Leading Manufacturer of epdm tapes, silicon rubber tape, butyl rubber tape, elastomeric rubber tape, butyl rubber sealing tape and butyl sealant tape from Dadra. Our organization is engaged in manufacturing, supplying and exporting a wide range of EPDM Tapes. Manufactured using high-grade raw material, these tapes are developed in compliance with international standards and norms. Owing to their high adhesion and durability, these tapes are widely demanded by the clients. 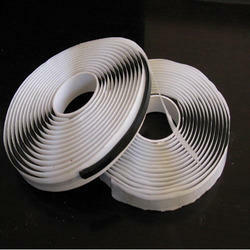 We are offering a quality approved array of Silicon Rubber Tape. The Silicon Rubber Tape we offer is widely demanded amongst the clients for its wide use. Moreover, made by using quality material these products are known for their precise use. Owing to our vast experience in this domain, we are engaged in offering a wide range of Butyl Rubber Tape. These sheets are manufactured using excellent quality butyl rubber, which is procured from the reliable vendors of the market. Known for their high strength, these tapes are widely used in commercial and industrial sectors for shock absorption and vibration damping applications. We offer these tapes in various thickness ranging from 1.2 mm up to 3 mm to meet the variegated requirements of our clients. It adheres to steel, aluminum, treated metals, wood, glass, zinc, epoxies and many kind of plastics. The Life of this product post application can be more than ten years. We manufacture Elastomeric Rubber Tape. Can supply any size on customer requirement. To cater the variegated demands of our prestigious clients, we are highly engrossed in providing a wide range of Butyl Rubber Sealing Tape. We offer Butyl Rubber Sealing Tape in various colors and are appreciated for flexibility and easy to use. Our Butyl Rubber Sealing Tapes are widely used in sealing of dams, tunnels, cement floors and retaining walls. Our offered tape is widely used in automotive, industrial, construction and roofing purposes. This tape is precisely manufactured at our vendors' end using the optimum quality basic material and contemporary machines. The provided tape is highly appreciated by our clients for its flexibility and water proof features. Sealing, adhesive properties and resilience. We are one of the leading manufacturers, suppliers and exporters of Butyl Sealant Tape. An effective environment friendly sealant, it finds application in various industries such as automobile, telecommunication, electronics, railways, construction, defense, shipping and others. 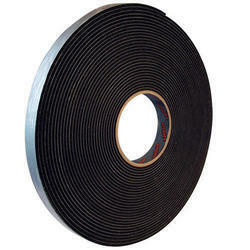 We also have roll formed butyl sealant tape in various widths and thickness. We are manufacturing, exporting and wholesaling a wide range of Butyl Tape. Butyl tape available in different colors, dimensions and various sizes. Butyl tape are manufactures using superior quality raw materials and they are made according to international quality standards. 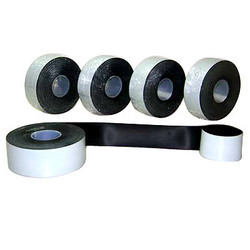 Butyl tape can be customized as per the specifications of the clients. We have a team of experts to fabricate and check the quality of the products. Our clients can avail from us Self Amalgamating EPDM High Voltage Tape that are widely used for primary insulation and jacketing. Provide moisture proof jacketing, our tapes are also used for joining straight & bifurcated joints. Mainly recommended for building stress cones, our tapes are available in various lengths, thicknesses and colors at marketing leading prices.